No one really knows what's going on with Tweetie 2 for Mac: a first beta should have been out a month after the latest MacHeist, and those who bought the bundle should have been able to get early access to the beta. Then Twitter, Inc. purchased Loren Brichter's atebits development studio and the Tweetie brand, but decided that only the iPhone version of Tweetie should be Twitter's official client. While Tweetie for Mac was part of the deal, it wouldn't be renamed. So what happened to Tweetie 2 for Mac, exactly? We've taken a few steps back to re-analyze the situation, as no one is really following all the updates anymore. 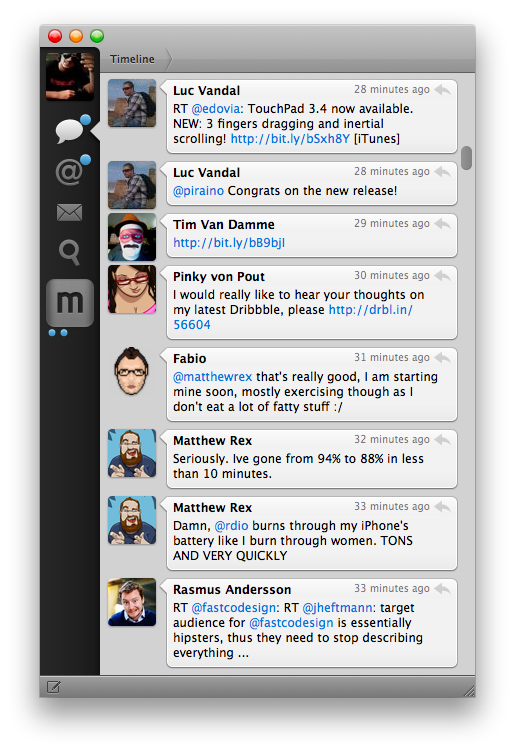 You can rest assured that Tweetie 2 for Mac is definitely happening, and it's going to be free. One more from me. People have been asking for specific details around Tweetie for Mac and I wanted to make sure we clearly message our plans as we know it. To be clear, Tweetie for the iPhone and its developer, Loren Brichter, were the focus of our acquisition, but as part of the deal we also got Tweetie for Mac. Loren had been hard at work on a new version of Tweetie for Mac that he was going to release soon. Our plan is to still release the new version and it will continue to be called Tweetie (not renamed to Twitter). We will also discontinue the paid version. So here's what happened: they bought Tweetie (for Mac and iPhone) and took Brichter with them. Still, they decided to rename Tweetie for iPhone to "Twitter for iPhone", leaving Tweetie for Mac out as an unofficial client. Basing on Twitter's official announcement of the acquisition, my understanding is that Twitter bought Tweetie and hired Brichter by entering an agreement with atebits. They didn't buy atebits, and that would explain why the website is still online and the fact that Tweetie 2 for Mac will be released as an unofficial client. Atebits is not dead, but it won't sell paid software anymore. We also got confirmation that atebits is still running, and will give anyone a free license of Tweetie 2 for Mac once it comes out. I guess they were referring to updated licenses for previous Tweetie 1.x customers, or MacHeist users. I don't know. Still, it's going to be free for anyone. Developer Loren Brichter swore up and down that the popular Twitter client would not die. “It’s not gonna die—I refuse to let it die. Everyone at Twitter loves the Mac version,” Brichter told Ars at WWDC this week. Although Tweetie 2.0 for Mac has been put off for a while thanks to the acquisition and the re-release of Tweetie for iPhone (now known as Twitter for iPhone), Brichter says he’ll be back to working on Tweetie for Mac within weeks. That, of course, isn’t the only thing Brichter is working on. As many iPad users know, Tweetie/Twitter has yet to arrive on the iPad in native resolution, but Brichter says it’s coming soon and, in fact, it’s so great that he wishes he could share some of the iPad code back to the Mac. “The goal is to exceed the Twitter iPhone app in the iPad,” he said. "I swear the reunification is coming between iPhone, Mac, and iPad. Now, I guess that since June things have changed a little bit, and weeks became months. Brichter was forced to work on Twitter for iPad, had to put Tweetie for Mac on the shelf and wasn't able to come up with the "reunification" of clients. How would that be even possible, though, with Tweetie being unofficial? The most important to thing to consider about Tweetie for Mac staying unofficial is this: as a platform and a company, Twitter wants you to use Twitter.com on your Mac desktop computer. They purchased Tweetie to turn it into an official client for the iPhone, but on computers - you have a browser and a revamped Twitter UI. On the other hand, atebits as a company is alive and so is Tweetie 2 for Mac. Last, take a look at these two tweets: one from Mike Rundle and retweeted by @lorenb, one from @atebits talking about "one platform left". We all know what he's talking about. Hopefully, it's coming soon.